As reliable, affectionate and loyal as dogs may be — as much as they may deserve to be called man’s best friend —any dog owner knows that they can’t exactly be trusted to stay clean for long. You’ll have to intervene frequently to keep your dog well-washed, but doing so by hand is difficult, spraying him with a simple garden hose will likely make him uncomfortable and always paying someone else to groom and wash your dog will eventually cost you an arm and a leg. Luckily, there is a wide selection of dog washing devices available that can come to your rescue and help easily keep your pooch both pristine and relaxed during a wash. The trouble is, of course, that there are so many dog washers to choose from. What’s a loving, but stressed out, dog owner to do? How can you keep from being overwhelmed by the sheer volume of options? To help you out, we’ve compiled a list of 10 of the best dog washers that you’re likely to find anywhere, and we’ll tell you about what each of them can do. To further sweeten the deal, we’ve added a helpful buyer’s guide where we discuss what to look for in any shower attachment or washing tool for your dog. With this information, we hope to make you into a smart and confident shopper that can find just what you and your little buddy need. 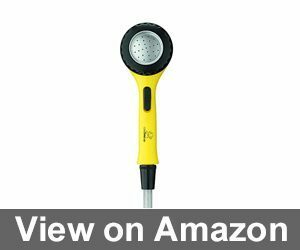 This well-crafted 13-inch shower wand comes with a dial that you can turn to alter and control water flow, allowing you to shampoo, wash or rinse your dog as necessary. The little jets of water spray out in a comb-like fashion, allowing water to penetrated deep into the fur of even thick-coated dogs. Another feature allows for a narrow spray of water that’s meant to hit hard-to-reach areas. You can easily hook it up either to a shower of faucet in your bathroom, or to a garden hose outdoors, enabling both indoor and outdoor washing. It also comes with a 8-foot long hose, an attachable suction cup to let you hand it from the wall and a storage hook that lets you hang it from your shower or some other convenient storage spot. Verdict: The overall quality of this dog shower is superb. It’s more expensive than many other units, but well worth it. 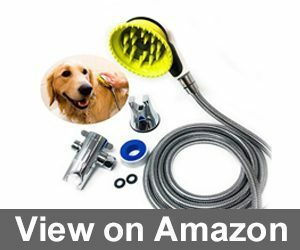 This very versatile dog showering kit comes with a flexible 8-foot metal hose, a shower diverter with a storage hook meant to hold the brush head, and a suction cup hook with which you can attach the shower head to a wall. 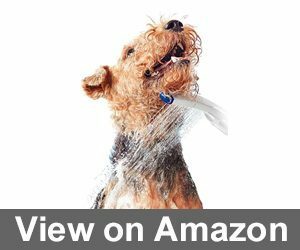 As for the shower head itself, it’s encircled by a splash shield meant to keep water from flying everywhere as you wash your dog.Also, it has an easy-to-use on/off switch, a comfortable handle and gives you the ability to attach it to your hand if necessary. 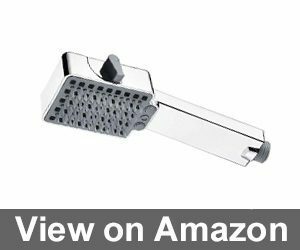 The shower head can also double as a brush because it has small rubber teeth along the rim of the splash shield and larger rubber teeth on the inside by the water jets. To use the larger teeth, simply fold the splash shield. Verdict: As an indoor dog washer, this unit’s versatility is second-to-none. We recommend using it to clean your dog indoors. 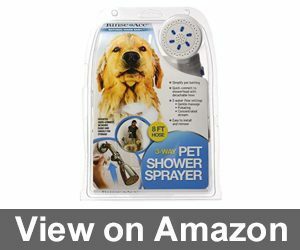 This dog spraying kit is meant primarily for indoor use and includes a shower want with a simple switch that you can press down with your thumb to shoot a jet of water, an 8-foot hose made of stainless steel, a shower arm diverter and a holding unit that you can put into the wall next to your ordinary shower head to keep the wand in place. If you so choose, you can also attach this unit to a faucet. Beyond washing your dog or other pet, you can also use to to clean diapers or to quickly wash your hands. Verdict: This is an excellent unit to buy, unless you have smaller dogs or dogs for which a gentler cleaning is most suitable. For that purpose there are better units available. This creatively-designed tool doubles as a water sprayer and a way for you to groom and scrub your dog. It’s reach charm lies in the fact that you can strap it onto the palm of your hand. Attached to an 8-foot long hose, it also comes with adaptors for your shower and for garden hoses or spigots, so you can use it both indoors an outdoors. The design speeds up bath time by just allowing you to wave your hand over your dog as you wash, rinse or scrub him down. Verdict: If you have a smaller dog or one with a thinner coat, this is an excellent tool to use. It’s convenience earns it a high recommendation. This dog shower comes with an 8-foot hose and an adaptor to allow you to quickly and easily attach it to your shower. It comes with three different water flow settings: a gentle massage setting for smaller dogs and for reaching a dog’s soft underbelly; a pulsating setting for rhythmic pulses of water that will massage your dog as it cleans him; and a concentrated stream setting for a deep and powerful clean. There’s also a variable flow lever that allows you to save water and control the strength of water flow as you wash your pooch. Verdict: If you’re on a budget, we recommend this as an excellent way to clean your dog, though you will have to do so indoors. 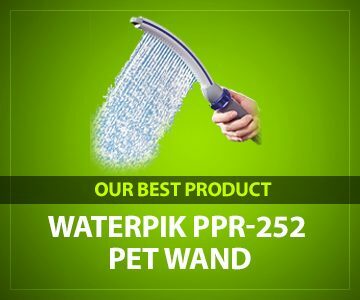 For those who would like to have the features of the Waterpik PPR-252 but are on a budget and cannot afford that model, we have the Waterpik PES-142. This model has many of the same features of the other Waterpik model that we considered above, only in a smaller form and at a lower price. The wand is 10.5 inches long and sprays water in a comb-like fashion. There is, however, only one spray setting. The wand comes with an 8-foot hose that you can attach to a shower, faucet or outdoor hose or spigot. Verdict: This is an excellent product if you don’t have much money to spend and your needs are simple. We recommend it as a cheaper alternative to the Waterpik PPR-252 for those who are short on cash. 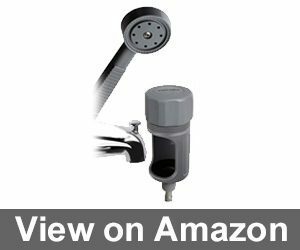 This small, handy and very versatile pet shower comes with a diverter to allow you to hook it up to your bathtub faucet. Thus, you can easily clean your do in your bathtub. 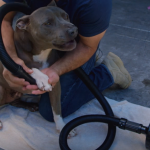 The soft PVC hose that comes with the shower head is 6.5 feet long, so it’s not as durable or as long as many other hoses that come with other dog showers. However, the small shower head sprays gently but well enough to thoroughly clean your pet. Because the shower head is small, however, it’s better suited for cleaning small dogs or even smaller children. Verdict: This is an excellent, affordable tool for keeping all kinds of smaller dogs clean. If you have larger dogs, however, we advise you to look elsewhere. This simple but very effective dog shower set includes an 8-foot hose and two adaptors — one for use with a shower, and another for use with a tub or outdoor garden hose spigot. The shower head features two settings: a wide full-body spray and and a narrower cone-shaped curtain spray. The former can be used for a gentle rinse while the latter is good for a deeper clean — especially outdoors. 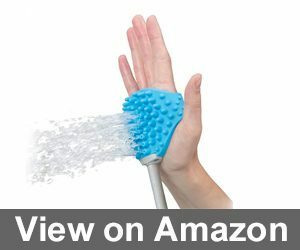 The shower head also comes with an attachment with soft massaging rubber fingers. Verdict: This is a decent cheap dog shower, but beware of the issues with connecting it to a tub faucet. Better options exist which are also reasonably priced. 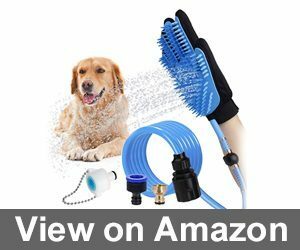 This combination of a grooming glove and water sprayer provides you with maximum versatility when cleaning not only dogs, but virtually another kind of furry pet you can imagine. Put on the glove, attach the 8-foot, 2.5-inch hose and being spraying down your pet while keeping your hands free. Not only that, after you’re done washing and rinsing out your pooch, you can use the rubber teeth on the glove to gently groom him. Furthermore, the gloved comes with adaptors of four different size so that you can be confident that your faucet will fit with one of them. With all of these features, the glove nevertheless remains very affordable. Verdict: We give this glove our highest recommendation. It’s combination of affordability, reliability and versatility is hard to match. Unlike the other products we’ve been considering so far — which were all general purpose dog cleaners — this product is intended specifically to make sure that your dogs paws stay squeaky clean. 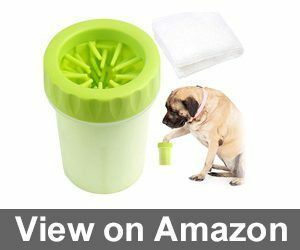 The Paw Legend Portable Dog Paw Washer is a cup with an insert filled with rubber bristles that go along the circumference for the cup. After you fill the cup with water, just have your pooch stick his paw into the cup and spin the cup around his paw for an effective cleaning. Small: 3.5-inch top diameter, 2.95-inch bottom diameter and 4.45-inch height. Fits a small puppy. Large: 3.85-inch top diameter, 3.35-inch bottom diameter and 5.9-inch height. Fits medium-sized breeds. Verdict: As a tool to clean your dog’s paws, this thing is superb. Of course, you will have to supplement it with other cleaning devices to give your dog a comprehensive cleaning. Now that we’ve provided you with a decent taste of what the market has to offer in helping you wash down your dog or pup, we’d like to round out round out your information a bit more. Beyond having some specific information about particular dog washing tools and their capabilities, we think you should also know some general things about what qualities or features make for a good dog washer. Since dog washing tools vary based on what part of your dog they are meant to wash or how they help wash your dog, not everything we say will apply to every tool. However, we’ll try to keep out discussion as general as possible. When a specific point we make only applies to a specific type of dog washer, we will say so. Before thinking about dog washers and their qualities, though, you should think about your dog. Different washing tools will be appropriate to different dogs, so the kind of dog you have will make a big difference to which washing tool is ultimately the right one. What kind of dog do you have? Do you have a puppy or a full-grown dog? Is your dog large, like a German Shepherd, or small, like a Maltese? A lager dog will probably need a larger and more powerful hose and shower shower attachment to guarantee that it gets a thorough wash, while something smaller and gentler will be more appropriate for a smaller dog. What kind of coat does your dog have? Is it smooth and short, or long and thick? Shower attachments and hoses that can spray water with greater force might be necessary to enable you to get deep into an especially thick coat and properly wash everything out, but a gentler clean would be sufficient for a shorter coat. Does your dog have an especially sensitive coat that requires careful grooming? In that case, something that provides you with a softer, gentler and more careful clean is certainly worth taking a look at. Ultimately, you know your own dog best, but these are the kind of things you should keep in mind when selecting a dog washing implement. The best general advice we can give you is: remember what your dog is like and use common sense. Number of different spray settings: Generally speaking, the more that a dog shower can do, the better it is. A shower that can spray water at different intensities, in different patterns or at different rates gives you more options to work with. This is especially useful if you have more than one dog, and if those dogs are different in ways that impact what the proper ways are to wash them. 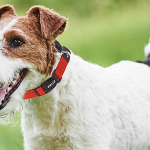 If a strong and consistent jet of water is best to properly clean one dog, but another requires a gentler approach, having one shower attachment that can do both of those things saves you the hassle of having to buy separate washing implements for each dog. Button or Dial Control: Somewhat related to the previous feature is the ability to regulate the flow of water with a dial or, if necessary, stop it with the push of a button. This increases convenience and makes the dog shower more versatile. Versatility, of course, only makes the shower attachment serviceable in a greater number of situations. 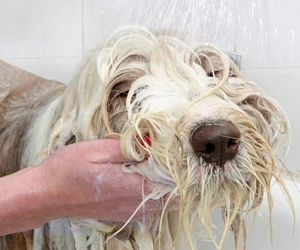 Hose Length: To was your dog thoroughly, you’ll need a rather long hose to go with your shower attachment. Some shower attachments come with a hose included, while others can be easily attached to a garden hose that you already have lying around. In any case, we recommend using a hose that is at least seven or eight feet long for two important reasons: first because you’ll need the extra length to be able to reach every last spot on your dog, and second because you won’t be washing him in close proximity to anything that you don’t want to get wet, and will therefore need a long hose to create the proper distance. Ease of Installation: You should buy a dog shower whose hose can easily attach to a faucet or garden hose. This is no area where you’ll want to be giving yourself headaches, so make sure that the shower you choose can easily and cleanly fit your faucet or hose. Know your faucet or hose diameter before making your choice. 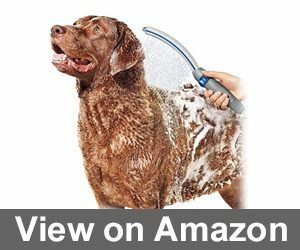 Hand Straps or Attachments: Some dog shower attachments come with straps that you can attach your hand, allowing you to spray down your dog while keeping your hands free to do other things, like scrubbing or lathering him up. As we’ve seen, some attach directly to your hand and double as dog grooming tools or enable you to scrub and was your dog with the same hand, which is particularly convenient. Storage Hooks: When you’re not using it, you’ll probably hang your do shower up somewhere. If it comes with a hook, this will make storing it or putting it away all the easier. Versatility: The more that a dog washer can do, the better it usually is. This doesn’t just refer to versatility in a dog washer’s functionality, like the number of different water spray settings it might have, but also versatility in what the washer can be used for. For example, if the same tool is excellent both for washing a dog and for giving a baby a gentle wash, that’s all the more reason to get it. Bristles: Some dog washing tools, though they come in various farms, may include bristles of some kind, which are generally used to either scrub your dog as you wash him down, or to groom him after he’s been washed. Something like this will allow you to kill two birds with one stone and make your life easier. Any one of the dog washing tools we brought up can save you significant time and labor in cleaning your dog. Since hiring a professional to wash your dog will cost you quite a bit, any of these devices can also save you money. We recommend giving them all a look, since any of them can play a crucial role in ensuring the all-important hygiene of man’s best friend. 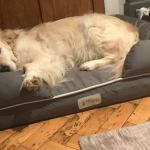 Looking out for your dogs is a simple but incomparable was of showing your love, so get yourself the right do washer and make that coat shine.